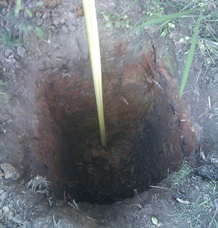 Once you have finished digging your footings you need to measure their depth. When measuring the depth of your hole always hold your tape measure straight up and down or plumb as it is called in the industry, and measure to the top of the hole just below the grass level. Always take a photo of each footing with a tape measure in the hole, ensuring you can clearly see the bottom of the hole. As you can see in the photo the tape measure is plumb, you can see the bottom of the hole and you can see the numbers on the tape measure. You will also need to take a photo of the width of the hole and it is good practice to make sure that your photos have a date stamp on them. To find out more about installing deck footings, you can purchase your own copy of our “Digging and Installing Footings” guide from the Resource Shop. Previous PostPrevious Cutting your decking boards neatly around posts.